After the release of Cha Jing Lu Yu took a long break enjoying himself travelling and catching up with old friends. He visited various tea cultivation districts in Jiangnan and sampled tea from various tea farms surrounding the Taihu lake area. In 783 Lu Yu arrived at Shangnao city and loved the natural beauty of the out-skirt area outside the city wall. He decided to lodge there and started looking around for a location with quality spring water. Lu Yu finally settled down about two miles north of the city, dug a spring well, built a home with garden and tea farm. In 785 famed Tang Poet Mengjiao visited Lu Yu's home in Shangnao area and was impressed with the beauty of Lu Yu's garden and tea farm. During his stay Mang Jiao wrote a poem about Lu Yu's home outside Shangnao city and included verses that praised the beauty of Lu Yu's farm and garden. Lu Yu a versatile, gifted and multi-talented man was knowledgeable in a wide range of subjects. Several years after Cha Jing was published Lu Yu was highly regarded as a well-informed multi-talented person. Many Tang officials consulted Lu Yu on a variety of subjects. Some even invited Lu Yu to visit their county to consult him on issues that they thought Lu Yu would be of invaluable help. In 786 Lu Yu was on official visit to Hongzhou on invitation of an old friend Imperial Envoy Xiao Yu of Hongzhou. Other than doing consultation work he also wrote several volumes of poems during his stay at Hongzhou. In 789 Lu Yu was invited by Nanling's Governor Li Fu on official visit to Guangzhou. He stayed in Guanzhou for a year and on the following year Lu Yu returned to Hongzhou. 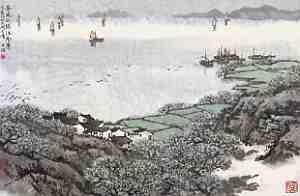 In 792 Lu Yu left Hongzhou and returned to his "Qingtang Bieye" home in Huzhou. He started writing again during this period and completed several books. A three-volume book on "The History of Wuxing's Officials" and one book on "The History of Huzhou's Prefects and Governors". In 795 Lu Yu completed his book on Water Quality titled "Shui Pin". In this book Lu Yu categorised and graded natural water in various locations in Tang China into 20 different quality gradings. In 795 after completing all these books Lu Yu was on the road again. This time he visited the historically rich land mark of Tiger Hill in Suzhou. In Tiger Hill he enjoyed the spring water from one of the top 5 springs in China, the famous Tiger Spring. Lu Yu built a house near Tiger Hill, as usual complete with a tea garden and tea farm. He stayed there for three years before returning home to Huzhou.